A luxury hotel experience at Houston’s most iconic address. The JW Marriott Houston Downtown intersects art, innovation and comfort. 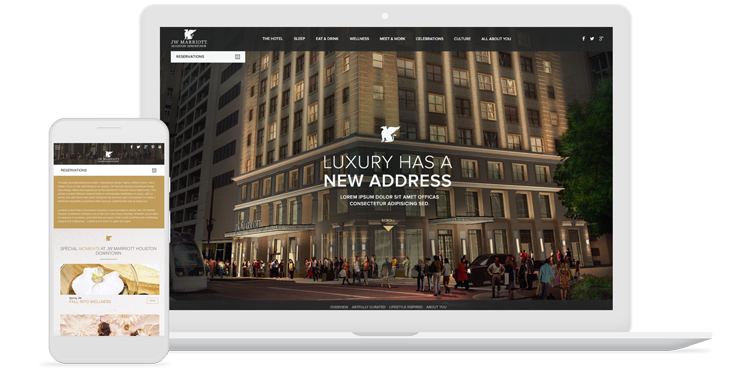 Our agency partnered with JW Marriott to create a stunning hotel web design for their luxury hotel in downtown Houston. We also created several print pieces at large and small scales to advertise for the grand opening. Through groundbreaking innovation, inspirational design, highly crafted cuisine and a holistic focus on the well-being of their guests, the JW Marriott Houston Downtown brings new energy, ideas and experiences to the Houston hotel scene. JW Marriott Houston Downtown challenged Mediaboom to create a bold new website that exceeds the standards of competing hotel websites in both design and functionality. Mediaboom was also hired to create large-scale advertisements that would grab people’s attention as they passed by the hotel’s construction zone, along with other sales tools to help promote the new hotel. The team at JW Marriott Hotel Houston made it their goal to intertwine the building’s 100 year old history into the new website design. Industrial elements and textures such as iron and glass, were main sources of inspiration during the website’s conceptual design phase. Mediaboom created a hotel web design that combined historic touches with modern technologies to showcase the hotel’s various amenities such as an award winning restaurant, a state-of-the-art health club, and a full-service luxury spa. Built with a responsive framework, users can experience the JW Marriott Houston Downtown website on both their desktop computers and their mobile devices. A custom sales kit was also created to promote the hotel. The sales kit features a series of interchangeable inserts that explain the hotel’s various amenities, and an elegant UV printed folder to keep everything together.